US, 1944, 81 minutes, Black and white. William Bendix, Dennis O' Keefe, Helen Walker, John Loder. 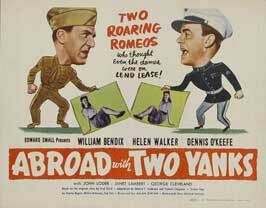 Abroad With Two Yanks is a slight comedy, a morale-boosting film made towards the end of World War Two. It seems to be meant as some kind of tribute to the collaboration between Australia and the United States, the last words of the film being praise for American forces. It is a kind of Abbott and Costello comedy with William Bendix as the short fat guy and Dennis O' Keefe as the tall thin guy. William Bendix offers a fairly sympathetic performance as Biff. Dennis O' Keefe is the macho manipulator. Helen Walker is the attractive heroine - with not a trace of an Australia accent. John Loder is Cyril, who has been rescued by Biff during an attack in the Pacific. The only sign of Australia is a kangaroo in a cage (not even Sydney Harbour Bridge) and a reference to Wahroonga. Alan Dwan was the director of a great number of films from the silent era into the '60s. 1. Popular American comedy of the war period? Morale-boosting? 2. The Australian setting, with the kangaroo and nothing else? The Americanisation of the plot - with some very flat and corny Australian accents? 3. Slapstick comedy, Abbott and Costello style? The pratfalls, the identity mix-ups, the farcical elements? 4. Biff and his rescuing Cyril, his pretending to be poetic, his trying to meet Joyce? Jeff and his being Biff's buddy but always trying to outwit him? 5. Jeff meeting Joyce, improvising, making up the stories, especially about Cyril's rescue? His infatuation with Joyce? All his attempts to win over Joyce, pretending to be schizophrenic, pretending to be angry, the proposal, being in jail, getting out for the concert rehearsal, disguised as Gwendolyn? His comeuppance? 6. Biff, explaining the situation, in love with Joyce, her refusal, his realisation that she loved Cyril, his coaching Cyril with all Jeff's phrases? In the brig, the scene with the sergeant and their insulting him? The concert, the rehearsals? The two men dressed as women for the last 20 minutes of the film, the drag comedy? 7. Joyce, upper-crust, helping the troops, intrigued by Jeff, admiring Biff, in love with Cyril? The mix-ups, especially Jeff's pretending to be the doctor on the phone? Her going along with the jokes? 8. Cyril, sheep station, in the war, rescued, going along with the jokes, in love with Joyce, using Jeff's phrases? The happy ending? 9. The popularity of this kind of slapstick comedy - the later ingredients of popular television shows?